You guys, I have so many things to blog about that I've mostly just avoided it altogether. I know, not the end of anybody's world. But I actually do want to share lots of these things because they are exciting to me and I like them. I've taken up a new crafty obsession, I've made progress on so many projects, I've learned new sewing skills and I really need to tell you guys about my recent Sewdown weekend because it was pretty amazing. I recently re-joined the charity quilting bee, Do Good Stitches. I left my original circle of the bee last year just to take a break, which lasted about 9 months. But then Rachel so kindly invited me to be in her circle, along with several other of my favorite online quilting buddies, and I just couldn't say no. Plus, this time I'm only a stitcher and not a quilter. That means I just make the assigned blocks each month and I never have to be in charge of planning and finishing the quilts. That feels much more manageable for me right now, so I was super excited to get back into it! This block was for Rachel's March assignment. 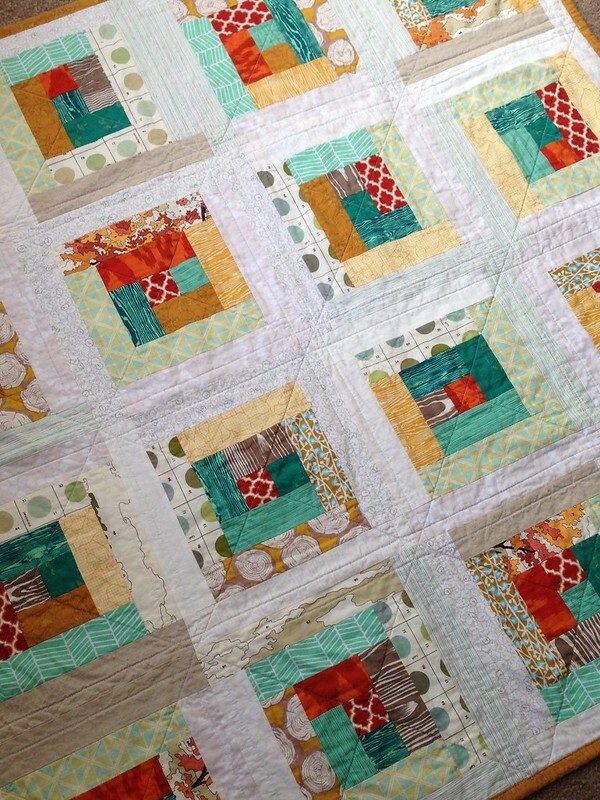 You can read about her instructions here, but she basically wants to make a quilt with a very eclectic piecing style but cohesive color scheme. So we had a lot of freedom of choice here. She did want our units to be traditional style blocks though, which she will put together in kind of an improv-y modern way. Cool idea, huh? So I had recently learned to paper piece (finally!) from my friend and boss at Sewn Studio, Julie. 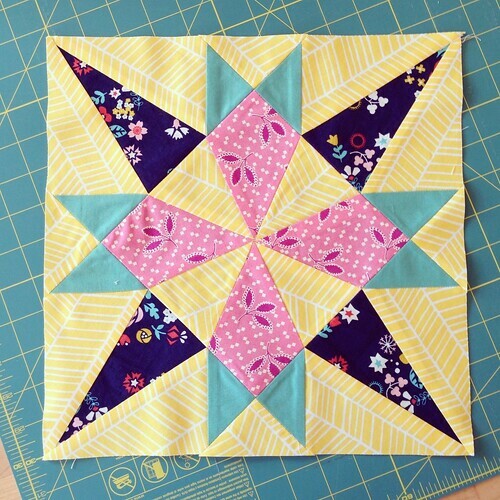 I was itching to try another paper pieced block that fit the traditional bill here, so I tried Faith's Star of Mystery tutorial. It was so fun to put together! 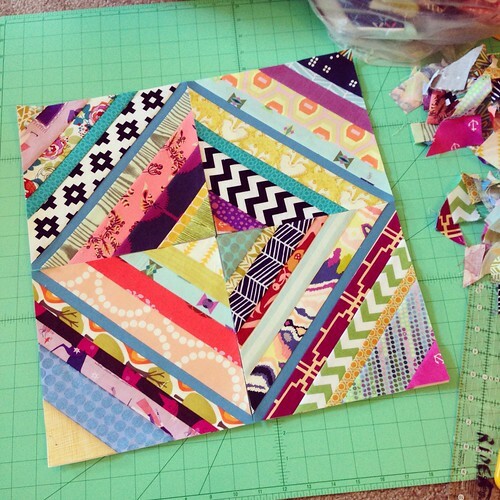 I can totally see why people get so easily addicted to paper piecing. 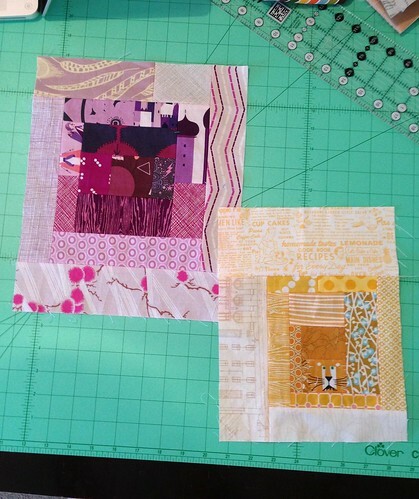 I also sent along some tiny hourglass units with my star for Rachel to work into the quilt somewhere. I can't wait to see how she puts this one together! 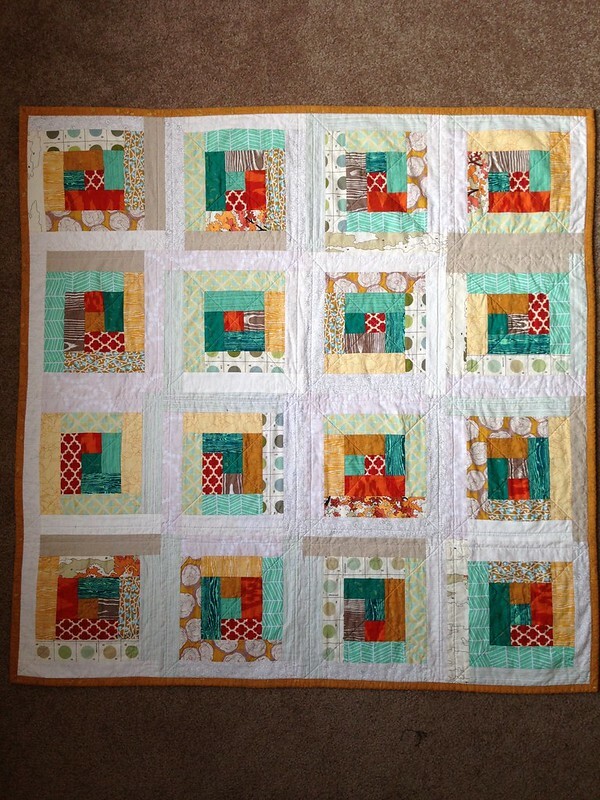 This month, Jacey asked for simple 8.5" scrappy string blocks with solid blue center strips. This was quick and fun for me since I just recently made a whole quilt that's very similar. This time, I didn't put any wonkiness into my cuts though, and tried to mix in more thin strips. I love them. I need to just always be making string blocks once in a while- the pile of string scraps is constantly growing! February was my first month with this group and Natalie (soooooo talented. I love everything she does!) asked for improv blocks that were one color each, but went from darker value in the center to lighter value around the outsides. 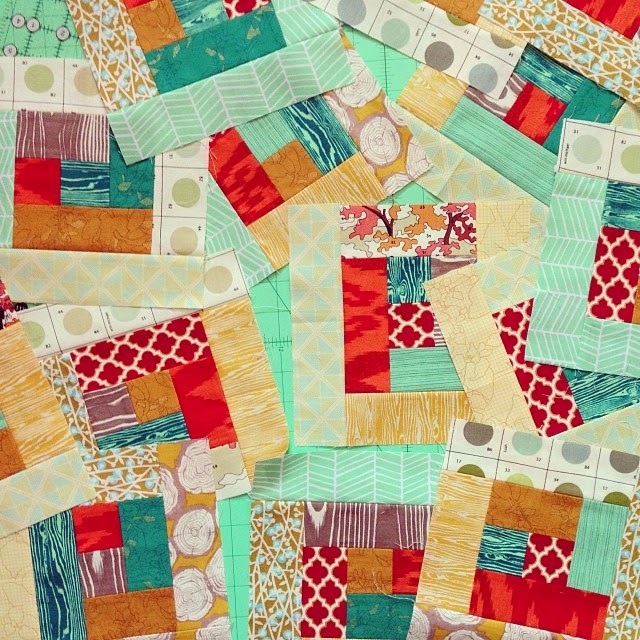 Now I also want to make myself a scrappy quilt in this style. She gave no size specifications for the blocks, they didn't even have to be square. I think that variation will make the whole quilt so interesting. Isn't this group awesome? It's nice to just follow someone else's directions when there is a perfect balance of guidance and creative freedom given. I can never wait to see what we are doing next. If you are interested in joining the bee, you can find sign-up info here, in the group news section. And if you are interested in seeing more timely, but less wordy updates from me, @alittlegressica on Instagram. This quilt was a little late getting to it's brand new baby tiny person, but I don't think he minded too much. Sam is our besets friends' new baby. He's put them over the two-kid-line both us and his parents never thought we'd cross. And we are over here watching in awe as they make it look totally easy :) We are so happy he is here, and I just had to make him a quilt of course. His mom showed me some colors she might like, and I honestly can't remember how closely I stuck to what we discussed... probably not all that close! I pulled everything for this quilt out of my stash, and the scheme started out with a lot of Carolyn Friedlander's Botanics line. It's my favorite fabric line that's come out in a long time and I've used it so many ways lately. To that I added some Lush Uptown, a few Joel Dewberry print, and other scraps that fit the scheme. I knew I wanted to do a simple log cabin quilt. 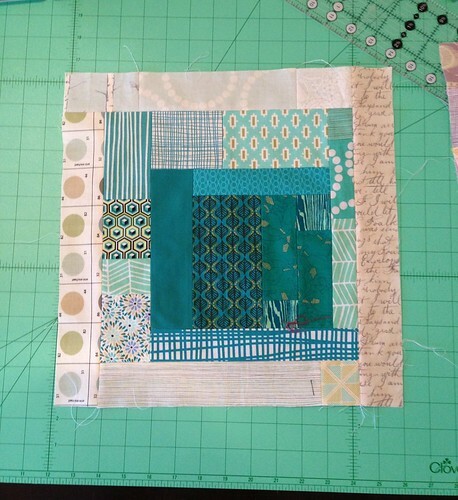 I decided to give it dimension by putting darker fabrics in the center and going lighter as the blocks grew out. The picture above is my progress as shown on Instagram (@alittlegressica) a couple months ago. I had done the darker value centers and then the layers of medium values around that, but hadn't added the final round of super light prints and linens. The back is this amazing fabric called Shetland Flannel by Robert Kaufman (purchased at Sewn of course, along with most everything else in the quilt.) It's super soft but also has a subtle herringbone texture in the weave. And the fibers going in each direction are two different colors, kind of like shot cotton. This one is blue combined with a citron-y yellow, and the light teal it makes is just perfect. 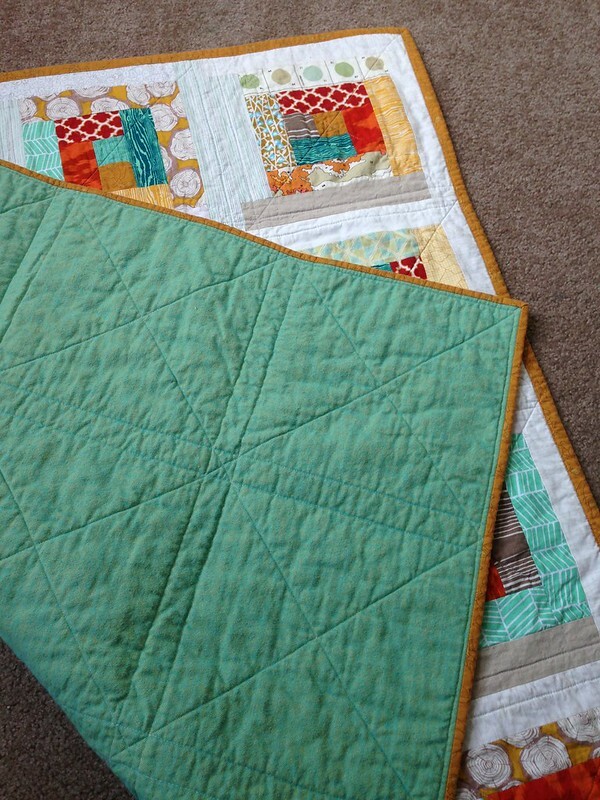 I kept the quilting pretty simple on this one so it would stay soft and flimsy. 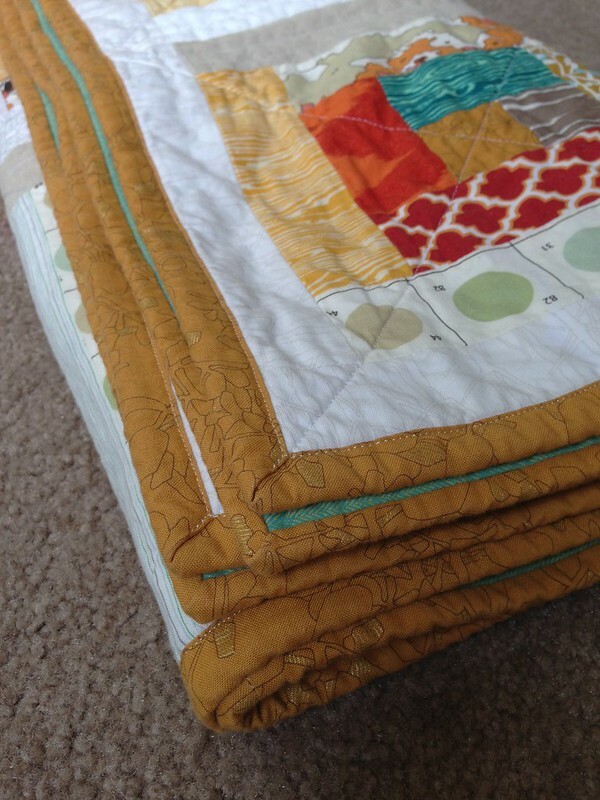 At first, I regretted not doing my favorite quilting- dense straight lines. But now that I see these pictures, I like the effect the large cross hatch has on the log cabin blocks. Sometimes keeping it simple works best. The binding is probably my favorite print from Botanics. Even baby boys need a little metallic gold in their lives right? Fabric designers, please make more prints in this dark gold color. I need them all. So baby Sam finally has a handmade quilt to hang out with. I really really love how this one came out and I might have to make another quilt in these colors for me to keep!